This year, I am taking on The Big Book of Christmas Mysteries, a 674 page tome containing 59 individual stories about the Christmas season. Conveniently, it’s broken up into blog-post sized sections. This is section two. The Burglar and the Whatsit, Donald E. Westlake - Short and clever, got great style. Dancing Dan’s Christmas, Damon Runyon - Enjoyable. Nothing unexpected. A Visit from St. Nicholas, Ron Goulart - Cute style, decent use of irony. The Thieves Who Couldn’t Help Sneezing, Thomas Hardy - Solid tale, not really a mystery. Almost fairy tale style. Rumpole and the Spirit of Christmas, John Mortimer - Ugh. I guess youre supposed to enjoy the humor and ignore the horrid classism. A Reversible Santa Claus, Meredith Nicholson - Longest story so far, pretty enjoyable. These were mostly pretty fun, with a couple of exceptions. The Thomas Hardy piece was fine, I guess, but it was so different. It follows a man who is waylaid on the road, and then he manages to expose the burglars in the midst of performing a second robbery. The points of the plot are very strange, and it has more in common with most fairy tales than most mysteries. The Rumpole story is another case of ‘wow, I have zero desire now to read anything else about that character’. It would be one thing if the style or the plot was good enough to make it worth slogging through, but it’s all about lawyers bartering over a case only for their own sakes, and with no care at all for the actual people involved. Wikipedia says that the character is characterized by sympathy for the ‘criminal classes’, but I’m not sure I saw that here. 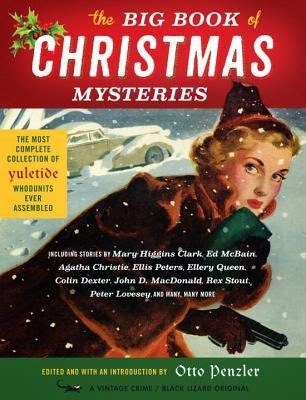 I expected to enjoy "Dancing Dan’s Christmas", and I did, although anyone who isn’t already familiar with the work of Damon Runyon would surely get more out of it than I did. "A Visit from St Nichola"s opens with this line, “THE MEDIA, AS USUAL, GOT IT completely wrong. The corpse in the Santa Claus suit hadn’t been the victim of a mugging and therefore wasn’t an all too obvious symbol of what’s wrong with our decaying society.” It’s pretty fun throughout. "The Burglar and the Whatsit" may now be one of my favorite examples of the ‘burglar dressed as Santa Claus’ trope. "A Reversible Santa Claus" is the longest story in the book so far, a tale of a family of retired criminals accidentally kidnapping a baby and then getting tangled in the affairs of the upper class family he belongs to. I’m not that surprised the the comedy stories were a bit more fun than the ‘traditional’ stories, but I am really looking forward to some of what’s still to come.